4.0 Lbs (WxLxH) 5.0" x 4.63" x 1.5"
Amazon's heading correctly identifies this as "Personal" Media Drive, but in the Technical Details, and Product Description, it says "pocket" media drive. This ambiguity creates confusion. 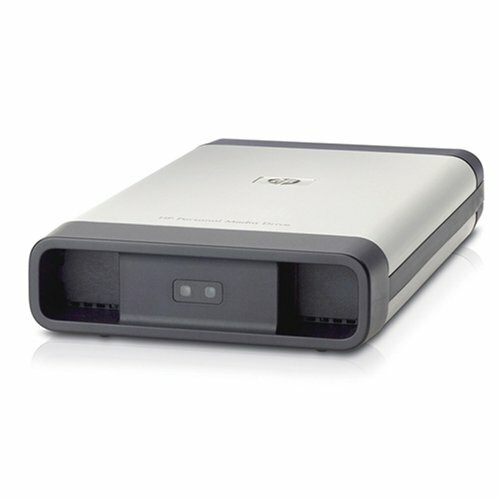 My HP uses the Personal (larger) format drive and has the larger slot, but some of them use the smaller "pocket" slot. To start off this review, I'd like to point out that this drive DOES work with HP models other than those included in the description. My HP m9040n claims it only supports 500MB Personal Media Drives and 160MB Pocket Media Drives, but this 750GB drive worked perfectly and was recognized instantly. I've owned a number of external hard drives, and this is by far my favorite. The 750GB gives you 698GB of usable space (using the 1GB = 1000MB standard). If you have an HP with a Personal Media Drive bay, this simply slides in and receives power and USB connection from the PC, so no additional cables are needed. To plug it into a non-HP machine, it includes a power adapter and USB Cable - I was a bit disappointed with how the power adapter is set up (it's a thick 3-pronged power cable, much like the one used to plug in your computer or monitor, which then plugs into a power brick and then into the drive itself - not the most portable if you plan to use it on the go). I would have also liked a firewire connection as the USB speeds can be limiting, especially if you have a large number of USB devices in use. The drive is very quiet (compared to my WD Mybook, it's almost completely silent). The fan also lines up with the slots in the back of HP machines to allow airflow when used in a personal media drive bay. I've used this drive for a few weeks and find it to be reliable so far - I haven't had it "disappear" like other drives have, it also hasn't given me errors when transferring files (even a 550 GB file transfer to the drive went without problems - it just took many hours!). This Personal Media Drive is a perfect fit for the HP Pavilion m9040n. My HP downloaded the drives automatically. There is no software. It's just plug n' play and unlike some other reviewers, I haven't noticed any noise at all coming from the fan on my pc or the drive itself. There are less expensive add on hard drives out there but they are external. The Seagate Free Agent series comes to mind as a good external hard drive in my experience. But, if you have an HP or Compaq that will accomodate the Personal Media Drive internally, then it's worth the extra money in my opinion. I agree with another reviewer who said "I feel like this drive completes my HP". I bought the 750GB hard drive a month ago. It constantly fails and is completely unreliable. What is more HP technical support literally laughed at this problem and me before hanging up. Bought this item from Amazon to be used with my HP M9340F (Vista 64-bit). It's easy to install and performs perfectly so far. Happy that I bought it. Formats to around 689 available gigs of space. Already have the personal media drive slot built into my Hewlett Packard so the quick slide fitting was perfect. The fan isn't noticeable unless your ear is directly on the CPU. Otherwise, the noise is adequate and not harming to me since I turn it off to go to sleep. Pros: Product works great with an HP compatible PC (that has the Personal Media Drive Docking space). I use this in my HP m8120n pc, and it disappears right into the front of my PC. Simple as that. Cons: As a separate drive to be used with any other pc, it still works fine, but it seems to never turn itself off. That's not a problem now, but its kinda annoying. Marvelous addition to my new HP Pavilion Media Center desktop computer. Drive slid into designated slot and immediately started up. The computer took a minute or two to recognize the new drive but one recognized has worked flawlessly. I like the look of the drive in the slot and will leave the cover door open to ventilate and show off. Using build-in software have already ran a backup and file verification of "C" drive in under 7 hours (almost 140 GB of data saved). I have not been troubled by any fan noise. Only issue remaining regards the pro-loaded files on the drive which consume over 50 GB's of memory. Near as I can tell most are foreign language versions of application and instructions. Can I safely delete them without HP coming and knocking on my door?